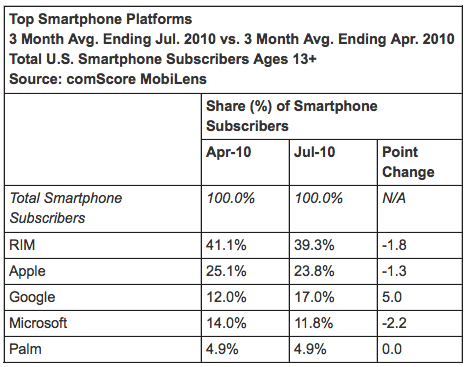 Considering that Steve Ballmer himself said that Microsoft “missed a cycle” in the smartphone sales universe, we guess it’s not too shocking to see Android leap past Windows Mobile and Friends in ComScore’s latest US smartphone report. If you’ll recall, we saw back in July that Google was tailing Microsoft by the slimmest of margins, and now that the latest data is live, it’s clearer than ever that Android is rising while the competition is slipping. The research firm’s MobiLens report found that Google’s market share in the US smartphone sector surged five percent in the three month average ending April 2010, while RIM sank 1.8 percent, Apple 1.3 percent, Microsoft 2.2 percent and Palm… well, Palm remained flat with just 4.9 percent of the pie. Of course, one has to assume that Microsoft loyalists are holding off on upgrades until Windows Phone 7 hits the market, but there’s little doubt that the flurry of higher-end Android phones has done nothing but help Google’s cause. And if Gingerbread actually brings support for serious 3D gaming? Look out, world. ComScore: Google’s Android surpasses Microsoft in US smartphone market share originally appeared on Engadget on Mon, 20 Sep 2010 07:42:00 EDT. Please see our terms for use of feeds.